In a medium bowl, combine all ingredients and stir to combine. Cover and refrigerate for 1 hour before serving. Keeps up to three days in the refrigerator. 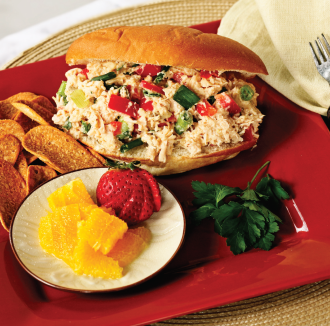 Place about two tablespoons chicken spread onto a soft roll and serve with a side of fresh strawberries and oranges. Try this: If you will keep the can of chicken in the refrigerator with all the other cold ingredients, you won‘t have to chill the salad before serving, because everything will be at the same temperature. Works well with tuna, also. It is not too far a stretch to say that everybody who plays the electric guitar owes something to Charlie Christian. He was born in Bonham in 1916, but when his father, a waiter, suddenly became blind in 1918, the family moved to Oklahoma City. Christian began his musical career on the cornet, but soon gave it up for his father’s favorite instrument, the guitar.